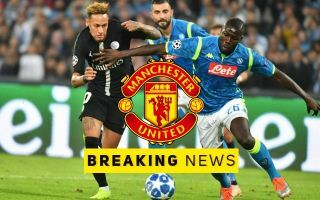 Manchester United transfer news to set fans’ hearts racing has emerged from intriguing reports in Spain, with Paris Saint-Germain superstar Neymar supposedly warning Real Madrid he’s ready to accept a move to Old Trafford. The Brazil international has been linked with a move away from PSG from almost the day he joined last season, with Real Madrid long thought to be his most likely next destination. However, a return to Barcelona has also been mooted on occasion, while there has also been talk of a move to either Man Utd or Man City in what would be a hugely exciting addition for the Premier League. According to Don Balon, Neymar has held talks with both Real and United, with some implication that a switch to the Bernabeu would still be his priority. However, the 27-year-old has also supposedly warned the Spanish giants that he has a tempting offer from the Red Devils as well, which he could be poised to accept soon unless they come up with anything better. This would be truly sensational business for United, who need a marquee signing up front after the failure of Alexis Sanchez, while there’s also been talk Romelu Lukaku could leave the club this summer. MUFC have been linked with other big-name attackers like Antoine Griezmann and Jadon Sancho, but signing Neymar would surely be the most exciting deal of the lot. After the incredible pace set at the top of the table by both City and Liverpool this season, it’s clear it would take something special for United to close the gap next season. An ambitious move like Neymar is just what’s needed to put Ole Gunnar Solskjaer’s side right in the thick of the title race, so fans will surely be keeping a close eye on this story and how it develops. It may be that the former Barca man is simply using United’s interest to coax a better offer from Los Blancos, but as long as talks have gone on, there’s always hope for fans of the Premier League giants.